Two labour intensive and time consuming tasks taken care of in one linear process. Our Sidewinders® have been developed through our own experiences as a contractor and the need for on the job profitability. One of the most frustrating time consuming and immeasurable aspects of any job can be the aesthetic finish of the verges after the carriageway has been completed. Our Sidewinder® offers the added advantage of a 1.0 meter wide cultivator able to tilth, redistribute and regrade existing verge materials to tie in to new asphalt levels. The volume of additional imported soil is reduced dramatically and in some cases completely removed. A truck loaded with topsoil is coupled to the Sidewinder® in the normal way allowing soil to be added to verge low spots as and when required. And if that’s not enough our Sidewinder® can be fitted simultaneously with a hydraulically powered grass seeder enabling the seed to be added forward of the cultivator which then mixes the seed within the soil. Two time consuming tasks completed in one swift cost effective process. Seed spread rate is infinitely variable and spread area is adjustable to suit width required. Maybe the job you just completed was an overlay or the re-alignment of a carriageway. 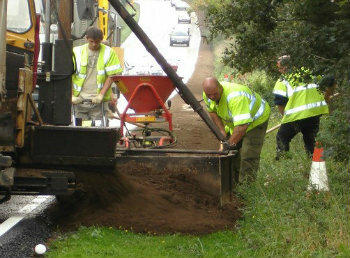 The same applies, we can place and grade hundreds of tons of top soil a day giving your job the finishing touch. 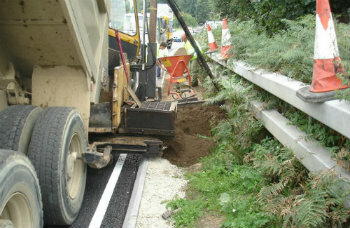 To see examples of our Sidewinders® Top soiling and seeding work in action click here. Alternatively to contact us directly click here.